41st Aircraft/Aircrews Lost Over the Pacific - Information on 41st Bomb Group aircraft and aircrews lost over the Pacific. Stories of the 41st - Stories and Personal Accounts. Missions of the 41st - Brian Fisher, grandson of Andrew Fisher, 47th Squadron, did extensive research at the National Archives in College Park, MD, copying much of the 41st Bomb Group's mission reports. The reports include a trove of information on all four squadrons' combat missions, such as date/time/location of missions, crew rosters, airplane serial numbers, casualty lists, and detailed timelines of each mission. Video of the 41st - Video from the Central Pacific, 1944. This is video uploaded to YouTube by Bob Dorough, one of our 41st 'Kids' and later colorized by Zeno's Warbird Videos. Bob's dad, Jim, served with the 48th Squadron. Bob also has a nice Facebook page for the 41st. To see it, click here. You will need a Facebook account to log in to it. 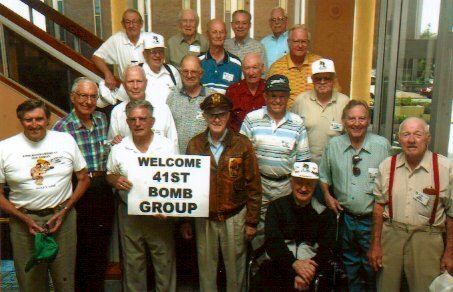 The National Museum of the Pacific War - Click on this link, navigate to 'Memorials', and then do a Find (using the Ctrl F keys) on "41stBombardment Group (M)" in the list to view our plaque dedicated Memorial Day, 2012. Group E-Mail Addresses - Members with E-Mail and or Web Pages. 41st Website Host Link - Sean Casey & Associates, LLC. Sean's dad, Vince, served with the 396th Squadron. High Flight Poem - by John Gillespie Magee, Jr.